One of the things I quickly gravitated to after joining the world of macintosh, was screencasts. In case you've never seen one, a screencast is essentially a moving screen capture. These are a sort of on-screen video where some generous soul walks you through the operation of a specific application or nuance of OS X. There are some excellent podcasts that do this along with a few other folks who just post them on their websites. While making screencasts to help fellow mac users understand their computers is great, there are a lot of other good reasons for a screencast. For instance, if you are having some strange application behavior, why not screencast it and send it to the developer. I've written those long convoluted developer emails and I'm betting if I had just sent a screencast things would have been easier for everyone involved. Or perhaps you have a friend who needs some gentle persuasion why OS X is the way to go. Make a screencast of yourself using iLife and send it to him. Another example would be to make a private tutorial, like to show your Mac Mom how to attach a picture to an email. Really the possibilities are only limited by your imagination. While I have been enjoying these screencasts for sometime now, I never really thought much about making one myself. Frankly, I had no clue how this is even possible. That is, until I started playing with iShowU. This application, which can be found at shinywhitebox.com takes all of the work out of screencasting. It is a snap to use. The interface satisfies the Jekyll and Hyde in all of us Mac users. That is, while iShowU initially strikes you with its simplicity, before long you realize it is also very customizable. When you open it up the left side has a slew of presets that make screencasting as easy as picking a self explanatory preset and pressing "Record". Alternatively, the right side of the interface has a series of self describing buttons that allows you a variety of options for fine tuning the resolution, quality, audio, and export codec just to name a few. In very little time you'll find yourself either using one of the many presets or perhaps tweaking it just a bit and then you are off to the races. The output options are very versatile and you can make a file as big and pretty as the job requires. Tweaking the frame rate and compression type, it doesn't take long to find out what works for you. 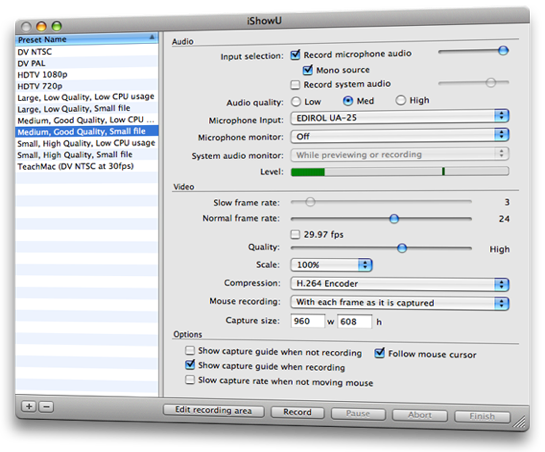 Once you start recording, you are free to roam your mouse over the screen while dictating into your mac with a running narration. It doesn't overly tax your processor and doesn't get in the way. As a test I ran it on top of Garageband, which can be resource heavy, and iShowU hung in there like a champ. One nice feature is the setting to allow the camera to follow your mouse. This way you can make a high resolution file with a smaller screen. If you need a screencapture tool, iShowU will get the job done with very little work on your behalf. By including multiple presets, the developer gives you the ability to immediately use the program while still giving you a large degree of control. If you don't need a screencapture utility, I still recomend you give this a try. You'll be amazed at the ways you can use this application. Shinywhitebox has a demo available on its website. A license will run you just $20 and I think it is an excellent value. Using iShowU, I can easily see myself adding a few screencasts to MacSparky.com in the future. While I'm not sure I can do them to the high standards of some of the regular screencasters out there, I certainly can see small clips to demonstrate some interesting feature.